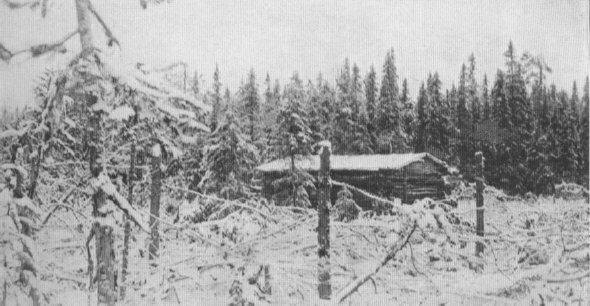 WHEN WINTER COMESExcept for the barbed wire entanglements in the foreground, this picture, showing the American front in Russia, might be mistaken for one of an early period in America--a clearing in the woods; in the center, a log blockhouse. 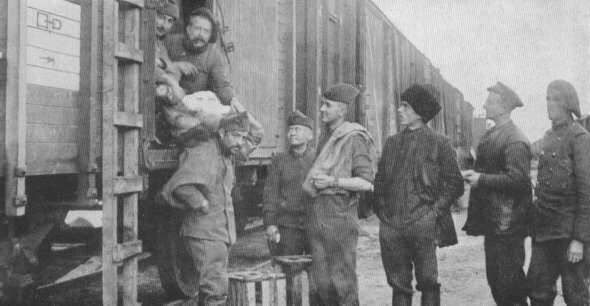 RATION DETAILThe picture shows Allied troops drawing rations from a train on the Vologda railway in North Russia. A Poilu is at the head of the queue receiving a quarter of beef; next in line are two Yanks, then a Russ, and two Tommies.